Dancehall entertainer Popcaan and Drake shut down the The O2 arena in London, England last night. The Canadian rapper brought out Poppy as one of his special guests for Tuesday night’s “Assassination Vacation Tour” stop. Popcaan instantly sent the audience into a frenzy performing his smash hit single “Only Man She Want.” This is the first time Popcaan has taken the stage with Drake since he officially became a member of OVO Sound Record label earlier this year. Jamaican sprint legend Usain Bolt was also in attendance. 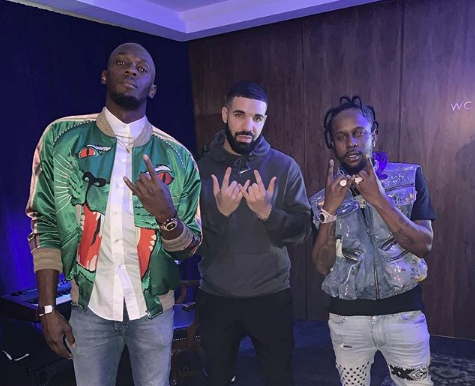 Shorty after the show Popcaan uploaded a photo with Drake and Bolt to his Instagram account. Last year December, Drake announced that Popcaan would officially become an OVO member in 2019 while performing at the inaugural Unruly Fest in St Thomas, “This is something we’ve been working on for a very long time, and I just wanna let everyone know that finally, officially 2019, Popcaan a sign to OVO label,” Drizzy said. Drake’s label is a Toronto-based record label he founded with Oliver El-Khatib, and long-time producer Noah ’40’ Shebib in 2012. It operates as a subsidiary of, and is distributed through Warner Music Group’s Warner Bros Records. The label has acts including Drake, PARTYNEXTDOOR, Majid Jordan, OB O’Brien, Roy Woods, and dvsn, as well as in-house producers 40, Boi-1da, T-Minus, Mike Zombie, Nineteen85, and Future the Prince.